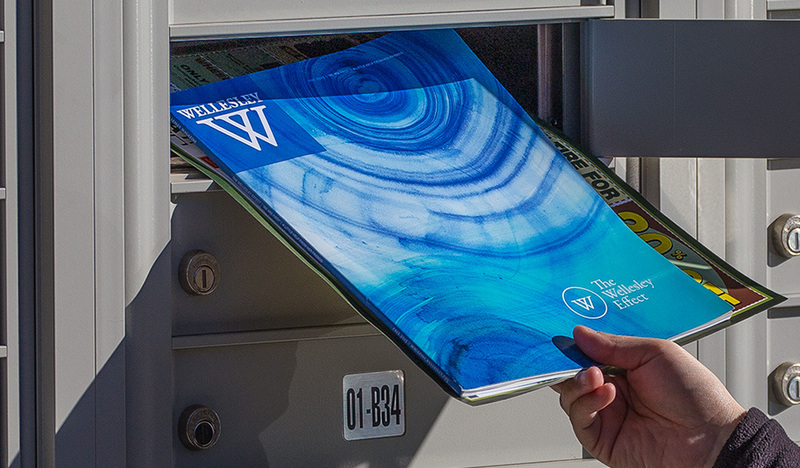 The fall 2015 issue of Wellesley magazine, which recently began arriving in mailboxes and is also available online, offers an in-depth look at the tremendous depth and breadth of the Wellesley Effect and the influence the College has had on generations of women. As Alice Hummer, editor of the Wellesley magazine, explains in her column, the Wellesley Effect is a transformation that happens in the lives of students as they begin “to envision themselves as capable Wellesley women with flair and the potential to be a force in the world.” Once the transformation begins, it continues for a lifetime and has far-reaching implications. "It's the way a Wellesley education transforms students, and then through their lives as alumnae, helps to transform the world," Hummer wrote. The cover story spotlights six alumnae who have inspired and helped those around them: a high school chemistry teacher who ignites her students' passion for the sciences; a Washington insider who helps Wellesley students find ideal internships; a beloved, pioneering law school professor; a former Marine who overcame traumatic injuries and now raises awareness about disabled veterans; a powerhouse in the economics department; and an infectious-disease physician who spends half her time doing relief work in countries that have been devastated by disaster. These examples, like countless others, illustrate how Wellesley women make a critical difference both in local communities and around the globe. Their stories also underscore the importance of Wellesley's Campaign to Advance the Wellesley Effect, an ambitious $500-million effort to sustain and broaden the College’s impact in the future. Cameran Lougy Mason '84, vice president of resources and public affairs, spoke with senior associate editor Lisa Scanlon Mogolov '99 about the campaign and its four broad institutional goals: intellectual community; affordability and access; a sense of place; and 21st century impact. "Everybody has experienced the Wellesley Effect and reinforces and amplifies the Wellesley Effect," said Mason, who wants the campaign to be as inclusive as possible. "There’s really something for everybody," she said. Affordability and access relate to another story in the issue—"We Are First"—that focuses on the challenges faced by first-generation college students. “At Wellesley, 12 percent of students are first-generation,” wrote senior associate editor Catherine O'Neill Grace. Wellesley's campaign will enable more underrepresented students to study at the College and to bring the Wellesley effect into wider and wider circles. Yet as Ann Velenchik, dean of academic affairs and associate professor of economics, told O'Neill Grace, "A lot of the conversation about first-generation students … is about the gift that Wellesley is giving those students in terms of the financial aid and support. I think we need to be focused equally on the enrichment that these student bring to our community," she said. Various faculty and staff members, many of whom were first-generation college students themselves, have developed a variety of structures and relationships to help first-gens access all of the opportunities available to them. For example, Donald Leach, associate director of residential life, collaborated with several colleagues in 2013 to create the Wellesley First Generation Network. In March 2015, the network hosted the Third Annual First Generation College Student Summit, where 200 students from 36 colleges and universities were welcomed. Senator Elizabeth Warren, a first-gen herself, gave welcoming remarks via videotape. Marilyn Koenick Yalom '54 rounds out the issue's theme in "A Little Help From Her Friends," where she describes how relationships formed at Wellesley last a lifetime and always have, even in the days before email, telephones, or airplanes. "How to encourage a friend in her personal and professional development is something many of us learned for the first time at Wellesley," she wrote. During the past 50 years, researchers and the general public have realized the importance of strong female friendships. "As a women's college, Wellesley will continue to promote strong bonds among its students, who will then carry a model of collaborative support into the world outside," Koenick Yalom wrote. That has certainly been true in her own life. "In May of this year, I flew from San Francisco to Boston to celebrate the 80th birthday of Lia Gelin Poorvu '56," she explained. "Lia and I have been friends since the fall of 1953, when we both lived on the French corridor in Tower Court," she wrote. Read more stories from the fall issue online, or follow Wellesley magazine on Twitter @Wellesleymag.